Home /Anime, Reviews, Television, Uncategorized/Stuff Sarah’s Obsessed With Right Now: Anime Edition! Agent Sarah here! Sorry that it’s been a while since I last posted! But after a much-needed hiatus I am back and ready to give you a briefing about some really awesome anime I’ve been watching! Premise: Ikuta is a seventeen-year old young man who only wants to loaf around and flirt with girls and read books about science and philosophy all day long. A series of unfortunate events causes him to get tangled in a political conflict between his country and a hostile neighboring country, and as a direct outcome of that he becomes a military officer. This is the story of Ikuta’s life in the service of his country and his journey to becoming a great commander as he uses his wit to climb the ranks and survive. Why I love it: There are at least a half-dozen shows on the Funimation app that share almost identical plot summaries, and it’s always hard to tell what you’re going to get when trying to choose one. Alderamin on the Sky is hands-down one of the better action/drama/military fantasy shows. 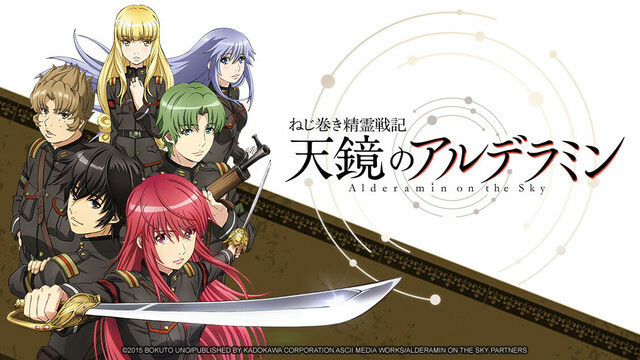 If you took the bits of Fullmetal Alchemist about Colonel Mustang and his crew, added a few fantasy elements and made it a separate show, you’d probably wind up with something in the same vein as Alderamin. The politics and supernatural and religious elements of the world are a little confusing and not fully explained, but the show provides enough context and information to understand the scenarios and outcomes, at least. To really boil my review down, what I like about it is that it follows this group of people– who are at first tenuous acquaintences or strangers– and become old friends over the years. We follow their relationships and personal developments. Ikuta is often on center stage but the anime pays careful attention to the development of side characters as well, as everyone plays an important role in the story. The anime is easy to watch. It’s casual and fun while being a little thought-provoking and playful at times, while serious and sentimental at others. When to watch it: Watch Alderamin on a long weekend when you can just loaf on the couch and marathon an anime in a few days. Premise: A middle-aged high school Biology teacher, Tetsuo Takahashi, is fascinated with “demi-humans”– you know, vampires, succubi, snow women, and dullahans– but he’s never been able to get close enough to one to talk to them. More than anything he’d just like to interview one and learn more about them. He lucks out when he meets all four of these demi-humans at his high school among the students and staff! He bonds with them as he learns about their daily lives and challenges and strives to help them feel at ease. Why I love it: This anime is unusual but it’s so sweet and charming! This is a very character-driven anime and it works because the cast is so balanced. Takahashi’s friendly yet professional demeanor is a great contrast with some of the others, like Hikari the vampire who has a really vibrant and wild personality, and Sakie the succubus (Takahashi pretends that he is not affected by her powers of seduction, so he’s the first man she’s ever felt comfortable with.) The dub writing is outstanding and there are some really funny moments in the show. 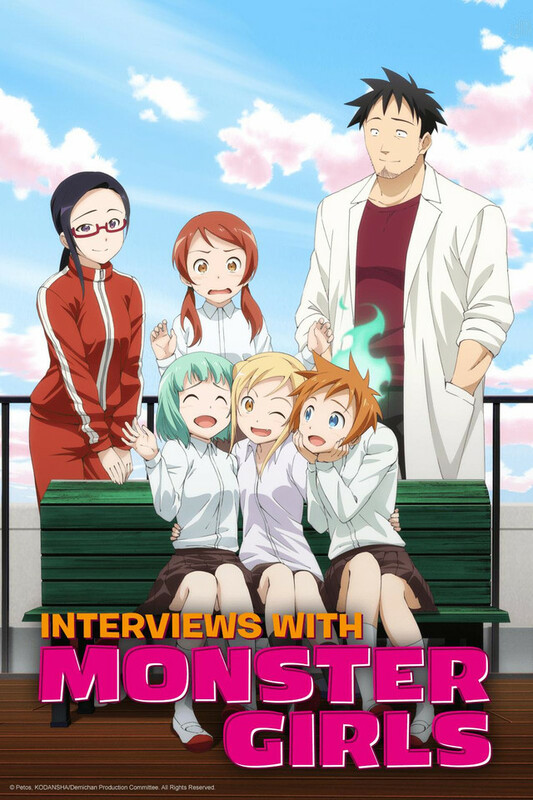 When to watch it: Watch Interview with Monster Girls if you’re having a bad day or need a little pick-me-up. Premise: Kazuma is kind of a shut-in nerd who abruptly dies in a traffic accident one day. He’s sent to the afterlife where a lovely goddess offers to send him to a different world, and he can bring any one thing of his choosing with him. 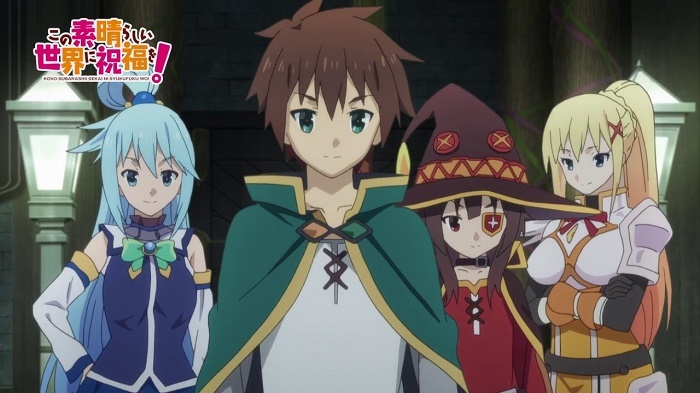 He chooses to bring the goddess herself with him, and thus begins Kazuma and Aqua the goddess’ journey into this brave new world (which coincidentally, is very much like a town from an RPG with dungeons and enemies and guilds and magic…) Together they form a guild and defeat enemies in order to make a living. Why I love it: If you missed Konosuba during it’s season one debut, one could hardly blame you. It tends to get lost in the shuffle with so many other animes with the same or similar premises: getting stuck in a game or characters finding themselves in a world that is very much like a game (and happen to be stuck there.) 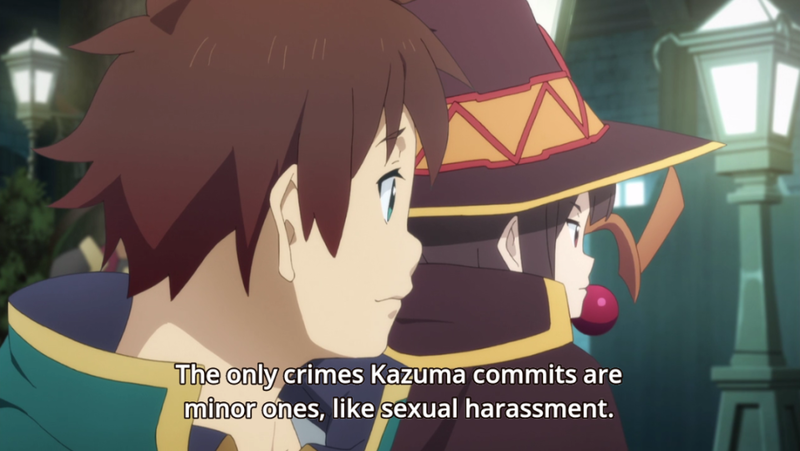 There are some real gems in that genre and Konosuba has a hard time standing out when compared with all those other shows. It’s best attribute is its light-heartedness and that’s just not as strong of a quality as, say, Log Horizon‘s intellectualism or SAO‘s sense of adventure or Re:ZERO’s world building. However, Konosuba is absolutely worth a watch and Season 2 is one more great reason to watch it. The first season had some really funny moments. The second season, however, builds on those moments and character traits from the first season and takes them to a whole new level. For example, Aqua was kind of a high-maintenance character in the first season. She’s so stubborn and thinks she’s above everyone (because she’s powerful and a goddess) but tended not to things through all the time and would often get herself in a pinch and require rescuing. She manages to exacerbate several situations in season 2 in basically the same ways, but with higher stakes. She attempts and fails to rescue Kazuma from jail multiple times- tossing him a lockpick to use on his combination lock, bringing a stool but having no way to get it into the prison, and so on. I would say the humor is more slapstick this season and at times the episodes just seem like a collection of comedy shorts, which actually works surprisingly well. When to watch it: Watch this show if you’re bored or need a good laugh! Premise: City boy Yugo Hachiken, tired of the pressure of prep school and exams, runs away to a rural agricultural high school. He’s the only student there that didn’t grow up on a farm and doesn’t have a specific interest in farming. He learns a lot about animals, where food comes from, and himself over the course of his freshman year. Why I love it: I did NOT think I was going to like this show. Turns out, I absolutely loved it! 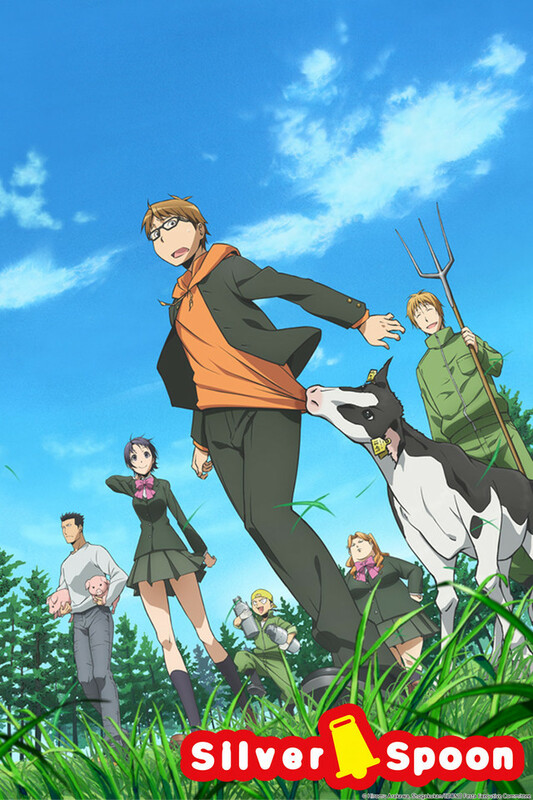 Agriculture isn’t really my cup of tea but there are many great qualities about this anime that make it a wonderful story and I found myself just wishing there was more of it. The first couple of episodes are a little odd, but trust me: just ride it out and the payoff will be worth it. 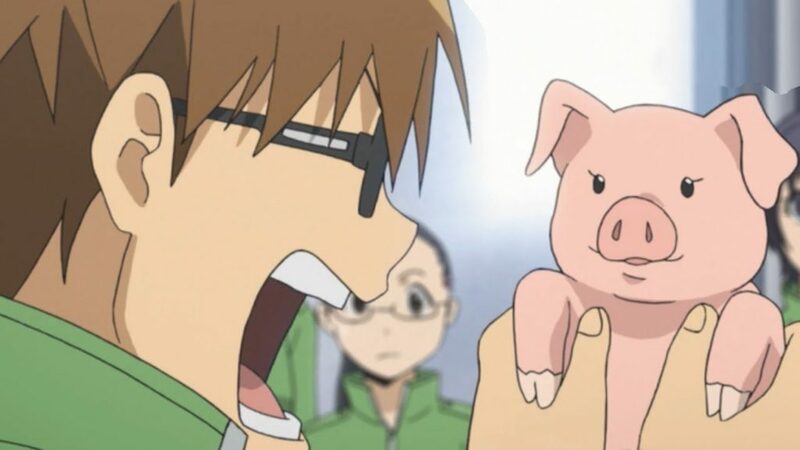 Among the anime’s merits: a thoughtful, informed, and propaganda-free plot arc about whether or not you can love animals and still eat meat; female body image positivity; descriptions of pizza that make it sound like the most delicious thing on the planet; and a horse that is kind of a jerk. When to watch it: Immediately. Run to the tv!!!! It’s on Netflix!!! Premise: Yuri Katsuki is a 23-year old world famous figure skater from Japan, and he just totally tanked his last competition. He goes home to Japan to contemplate whether or not to retire from skating when his idol and all-time favorite skater, the 27-year old Victor Nikiforov, unexpectedly shows up on his doorstep and offers to coach his next season! 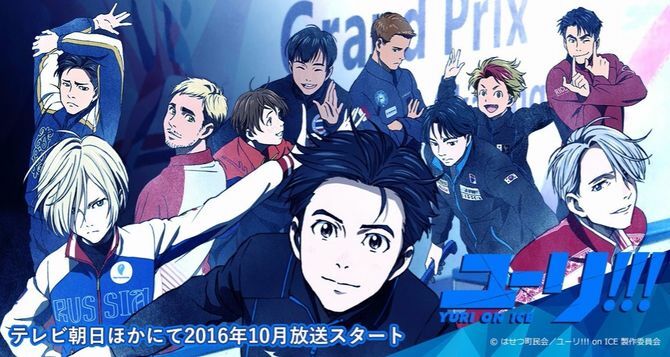 Can Yuri conquer his nerves and find a renewed passion for skating together with Victor as they travel the world to compete? 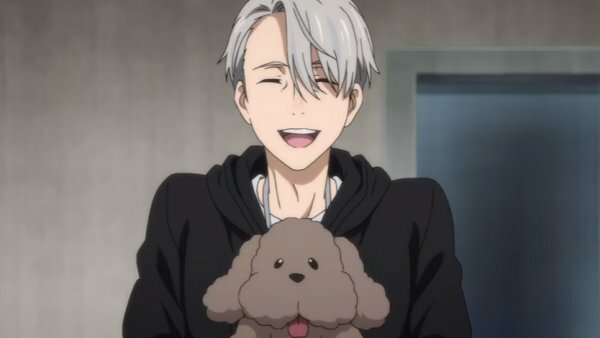 If an attractive Russian guy showed up on YOUR doorstep with a cute dog, would YOU turn him away?! I can’t believe I’m saying this, but I think this might actually make it into my top 10 list of all-time anime favorites (a list that is pretty untouchable, since I’ve seen ~400 animes.) It showed me something new and immersed me in a different world. This anime has so much to give and hopefully I am not overhyping it and letting everyone down. When to watch it: Watch Yuri!!! On Ice when you feel like you’re missing something in your life or you’re feeling a little empty inside. It will fill you up. 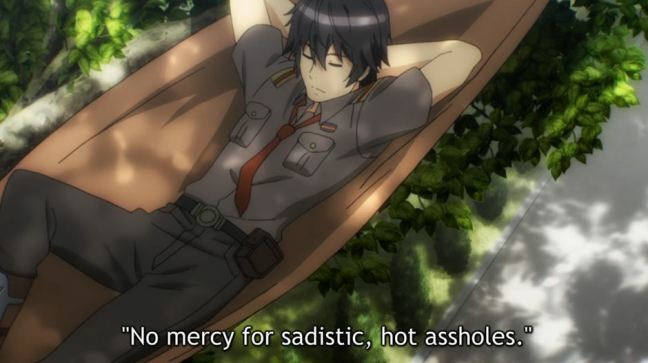 I hope you all enjoyed my thoughts about some of these animes. I would love to know what you think as well, if you watch them! Yuri!!! On Ice, Alderamin on the Sky, and Interview with Monster Girls are all available for streaming on Crunchyroll or Funimation. Konosuba is available for streaming on Crunchyroll. Silver Spoon is available for streaming on Netflix.